When it comes to candy, decision-making is not my forte. 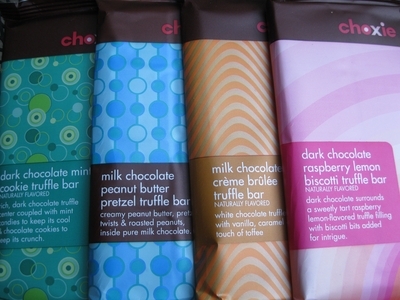 On a recent visit to Target, I stood in the candy aisle, dazzled with options, and ended up leaving with not just one of their store-brand Choxie truffle bars, but four. Choxie has been around for a while, but I hadn’t tried anything in this line. I chose two milk chocolate bars and two dark chocolate bars: a dark chocolate raspberry lemon biscotti truffle bar, a dark chocolate mint cookie truffle bar, a milk chocolate crÃ¨me brÃ»lÃ©e truffle bar, and a milk chocolate peanut butter pretzel bar. The shiny, colorful packaging and the descriptions of what those packages contained rendered me (and my wallet) utterly helpless. I couldn’t wait to get home and discover how nearly $10 of Target candy products would taste. I haven’t posted a review here for a while, but it’s not because I haven’t been eating candy. It’s because I made the mistake of saying that I would review these Target chocolates, and I have been unable to face up to it. It’s just too depressing. I have prided myself on always being able to get something to write out of a candy – if it’s terrible, at least finding something funny to say about it. But there’s nothing funny about how bad these are. It’s just totally depressing that Target thinks they can fool us into thinking that these are ‘artisan truffles’ just because they have fashionable flavor names and are visually a poor imitation of the most high-end sort of chocolate, and that it doesn’t matter that as something to actually eat, they’re totally awful. I have a ton of candy left to review from the All Candy Expo, but I decided I needed a small break from upcoming candy to review some of the candy I already had that happens to have a short lifespan. 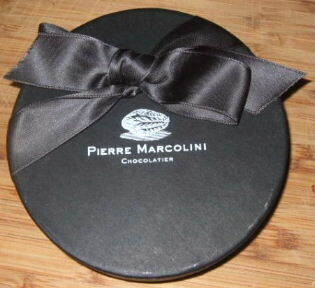 My good friend Greg was kind enough to pick up some candy for me from his recent expedition to Europe, which resulted in me receiving a box of Pierre Marcolini truffles. For those of you not familiar with Mr. Marcoliniâ€™s work, he is a Parisian chocolatier who travels the world in order to find the best ingredients and flavors for his chocolate. 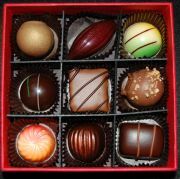 The round, 15-piece box containing small, spherical truffles dusted in cocoa and set in what looks like a couture hatbox is valued at almost $50, so these are most likely out of your typical Candy Addictâ€™s price range. I was super excited to try them knowing I would otherwise probably never taste such a thing.